For a very long time, scientists had been working to give people the ability to finely-control swarms of nanites by thought or gesture, but no workable solution had been found for an individual to take command over the millions of individual nanites that make up a swarm. Then, in 2616 B.E., a Shen void user named Amasha Atiq managed to bring the level of control necessary without the rapid degradation previous attempts had seen. The key, as it turned out, was using void kith, but not in its raw form, which had been tried many times without success. Kith can be quite powerful, but lacks the precision required on its own. What Amasha discovered was that by filtering the void kith through psuedo-organic circuits, in the form of intricate tattoos inscribed using the substance called iriil. This kith-associated material is only found orbiting, at high velocity, the largest black holes. Iriil doesn't fit into the commonly-accepted forms of solid matter - gas, liquid, solid, plasma - and appears to sometimes have the properties of all four simultaneously. What we're certain about, however, is its strong connection to kith. Unlike astrium, which is believed to be a byproduct of iriil decay, iriil itself appears to have a direct relationship to kith, or perhaps could be said to 'contain' some kith. 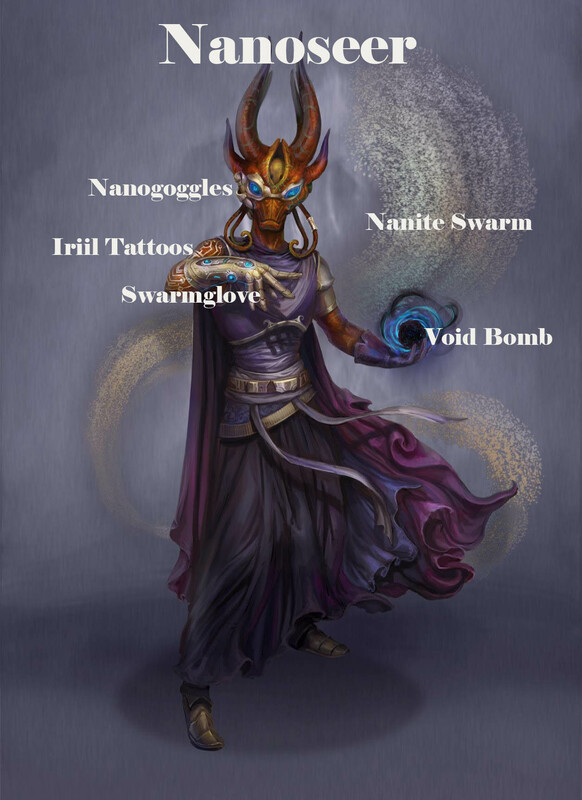 Nanoseers, therefore, funnel void kith into these iriil tattoos, where the kith is 'filtered' into a force with less raw power but far more precision, and then transmitted to the nanite swarm via the swarmglove worn on the same hand as the iriil arm tattoo. 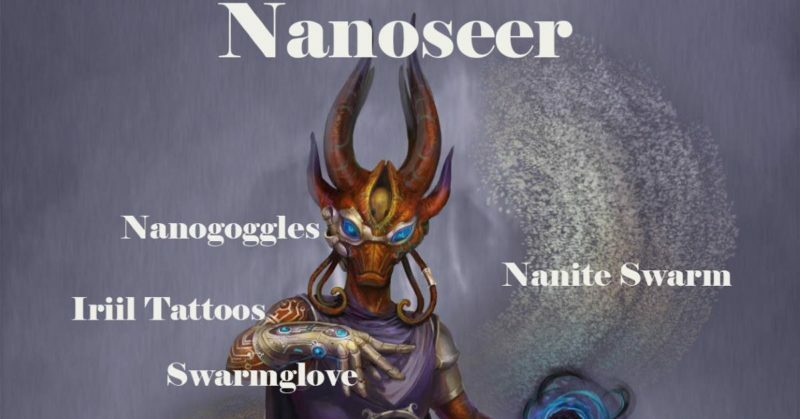 The nanogoggles permit the nanoseer to see an alternate reality layer to help them see what the individual members of the swarm are doing. Nanites - Control over a nanite swarm as detailed above. Voidism - Using the power of void kith, they're able to do things like levitate, hurl props around by creating localized voids in the direction they wish to hurl the item, throw void bombs, and more. Oblivion - This mystic skill sees the nanoseer connecting to and using energy from the long-dead Empyreals - the eldest beings known in our universe. Their energy, filtered through black holes, is what we know as void kith, but even after the filtration process all energy isn't the same. The different Empyreals had differences in 'flavor' and by tuning into these various 'frequencies', one gains various abilities, like gaining immunity to different kinds of damage, reversing your local timeline for a few seconds, destroying an item, and more. The five Empyreals able to be tuned to are the Architect (also called the Omega), the Conqueror, the Traveler, the Progenitor, and the Sunderer.